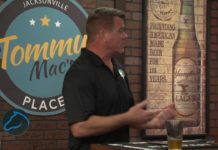 Welcome to the Jacksonville BUZZ, the newest lifestyle and entertainment guide on eating, drinking, playing and living it up in the Bold City. Expert hosts Adrienne Houghton and Grant Smith are a delight to watch, treating viewers to fascinating guests, laugh-till-you-cry moments and insider tips on enhancing every aspect of your life on the First Coast. the world as a professional dancer and fashion model, Adrienne has been actively sought out by well-known brands for design and fashion consultation since her move to Jacksonville in 2004. Tune in for her secrets to style success, and follow her on Instagram @firstcoastfashion. Jacksonville native GRANT SMITH is a Renaissance man-about-town—he cooks, he travels, he’s outdoorsy, and he’s aces at finding the local hidden gems we’re all eager to visit. Not to mention, he’s good at sharing! His designed-to- impress recipes will no doubt become go-to menu items, and it’s hard to say no when he invites you to his next favorite event. Follow Grant on Instagram @grantsadventures. We are also always joined by our amazing and talented BUZZ TV Correspondents. From Ellen Cottrill to Brittany Shaw, they join us here on The Jacksonville Buzz whenever they have a guest who is just to buzz worthy. Today, Grant sat down with Scott Kornberg with Jacksonville Jumbo Shrimp.